Map of SEATO members, shown in blue. The Southeast Asia Collective Defense Treaty, or Manila Pact, was signed on 8 September 1954 in Manila, as part of the American Truman Doctrine of creating anti-communist bilateral and collective defense treaties. These treaties and agreements were intended to create alliances that would contain communist powers (Communist China, in SEATO's case). This policy was considered to have been largely developed by American diplomat and Soviet expert George F. Kennan. President Dwight D. Eisenhower's Secretary of State John Foster Dulles (1953–1959) is considered to be the primary force behind the creation of SEATO, which expanded the concept of anti-communist collective defense to Southeast Asia, and then-Vice President Richard Nixon advocated an Asian equivalent of NATO upon returning from his late-1953 Asia trip. 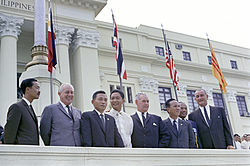 The organization, headquartered in Bangkok, was created in 1955 at the first meeting of the Council of Ministers set up by the treaty, contrary to Dulles's preference to call the organization "ManPac". SEATO was intended to be a Southeast Asian version of the North Atlantic Treaty Organization (NATO), in which the military forces of each member would be coordinated to provide for the collective defense of the members' country. Organizationally, SEATO was headed by the Secretary General, whose office was created in 1957 at a meeting in Canberra, with a council of representatives from member nations and an international staff. Also present were committees for economics, security, and information. SEATO's first Secretary General was Pote Sarasin, a Thai diplomat and politician who had served as Thailand's ambassador to the U.S. between 1952 and 1957, and as Prime Minister of Thailand from September 1957 to 1 January 1958. Unlike the NATO alliance, SEATO had no joint commands with standing forces. In addition, SEATO's response protocol in the event of communism presenting a "common danger" to the member nations was vague and ineffective, though membership in the SEATO alliance did provide a rationale for a large-scale U.S. military intervention in the region during the Vietnam War (1955–1975). Despite its name, SEATO mostly included countries located outside of the region but with an interest either in the region or the organization itself. They were Australia (which administered Papua New Guinea), France (which had recently relinquished French Indochina), New Zealand, Pakistan (including East Pakistan, now Bangladesh), the Philippines, Thailand, the United Kingdom (which administered Hong Kong, North Borneo and Sarawak) and the United States. The Philippines and Thailand were the only Southeast Asian countries that actually participated in the organization. They shared close ties with the United States, particularly the Philippines, and they faced incipient communist insurgencies against their own governments. Thailand became a member upon the discovery of the newly founded "Thai Autonomous Region" (the Xishuangbanna Dai Autonomous Prefecture) in Yunnan (in South West China) – apparently feeling threatened by potential Chinese communist subversion on its land. Other regional countries like Burma and Indonesia were far more mindful of domestic internal stability rather than any communist threat, and thus rejected joining it. Malaya (including Singapore) also chose to not participate formally, though it was kept updated with key developments due to its close relationship with the United Kingdom. The states newly formed from French Indochina (North Vietnam, South Vietnam, Cambodia and Laos) were prevented from taking part in any international military alliance as a result of the Geneva Agreements signed 20 July of the same year concluding the end of the First Indochina War. However, with the lingering threat coming from communist North Vietnam and the possibility of the domino theory with Indochina turning into a communist frontier, SEATO got these countries under its protection – an act that would be considered to be one of the main justifications for the U.S. involvement in the Vietnam War. Cambodia, however rejected the protection in 1956. The majority of SEATO members were not located in Southeast Asia. 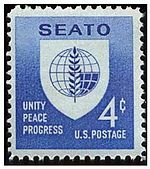 To Australia and New Zealand, SEATO was seen as a more satisfying organization than ANZUS – a collective defense organization with the U.S. The United Kingdom and France joined partly due to having long maintained colonies in the region, and partly due to concerns over developments in Indochina. Last but not least, the U.S. upon perceiving Southeast Asia to be a pivotal frontier for Cold War geopolitics saw the establishment of SEATO as essential to its Cold War containment policy. All in all, the membership reflected a mid-1950s combination of anti-communist Western nations and such nations in Southeast Asia. The United Kingdom, France and the United States, the latter of which joined after the U.S. Senate ratified the treaty by an 82–1 vote, represented the strongest Western powers. Canada also considered joining, but decided against it in order to concentrate on its NATO responsibilities. After its creation, SEATO quickly became insignificant militarily, as most of its member nations contributed very little to the alliance. While SEATO military forces held joint military training, they were never employed because of internal disagreements. SEATO was unable to intervene in conflicts in Laos because France and the United Kingdom rejected use of military action. As a result, the U.S. provided unilateral support for Laos after 1962. Though sought by the U.S., involvement of SEATO in the Vietnam War was denied because of lack of British and French cooperation. Both the United States and Australia cited the alliance as justification for involvement in Vietnam. U.S. membership in SEATO provided the United States with a rationale for a large-scale U.S. military intervention in Southeast Asia. Other countries, such as the UK and key nations in Asia, accepted the rationale. 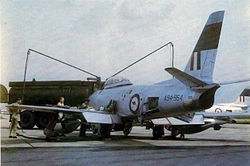 In 1962, as part of its commitment to SEATO, the Royal Australian Air Force deployed CAC Sabres of its No. 79 Squadron to Ubon Royal Thai Air Force Base, Thailand. The Sabres began to play a role in the Vietnam War in 1965, when their air defence responsibilities expanded to include protection of USAF aircraft using Ubon as a base for strikes against North Vietnam. In addition to joint military training, SEATO member states worked on improving mutual social and economic issues. Such activities were overseen by SEATO's Committee of Information, Culture, Education, and Labor Activities, and proved to be some of SEATO's greatest successes. In 1959, SEATO's first Secretary General, Pote Sarasin, created the SEATO Graduate School of Engineering (currently the Asian Institute of Technology) in Thailand to train engineers. SEATO also sponsored the creation of the Teacher Development Center in Bangkok, as well as the Thai Military Technical Training School, which offered technical programs for supervisors and workmen. SEATO's Skilled Labor Project (SLP) created artisan training facilities, especially in Thailand, where ninety-one training workshops were established. SEATO also provided research funding and grants in agriculture and medical fields. In 1959, SEATO set up the Cholera Research Laboratory in Bangkok, later establishing a second Cholera Research Laboratory in Dhaka, Bangladesh. The Dhaka laboratory soon became the world's leading cholera research facility and was later renamed the International Centre for Diarrhoeal Disease Research, Bangladesh. SEATO was also interested in literature, and a SEATO Literature Award was created and given to writers from member states. Though Secretary of State Dulles considered SEATO an essential element in U.S. foreign policy in Asia, historians have considered the Manila Pact a failure and the pact is rarely mentioned in history books. In The Geneva Conference of 1954 on Indochina, Sir James Cable, a diplomat and naval strategist, described SEATO as "a fig leaf for the nakedness of American policy", citing the Manila Pact as a "zoo of paper tigers". Consequently, questions of dissolving the organization arose. Pakistan withdrew in 1972, after East Pakistan seceded and became Bangladesh on 16 December 1971. France withdrew financial support in 1975, and the SEATO council agreed to the phasing out of the organization. After a final exercise on 20 February 1976, the organization was formally dissolved on 30 June 1977. ^ "History of Thai Prime Ministers". Royal Thai Government. Archived from the original on 26 April 2011. Retrieved 22 April 2011. ^ a b c d "Southeast Asia Treaty Organization (SEATO), 1954". Office of the Historian. U.S. Department of State. Archived from the original on 7 October 2012. Retrieved 3 October 2012. ^ US PSB, 1953 United States Psychological Studies Board (US PSB). (1953). US Psychological Strategy Based on Thailand, 14 September. Declassified Documents Reference System, 1994, 000556–000557, WH 120. ^ Nehru Has Alternative To SEATO. (5 August 1954). The Sydney Morning Herald (NSW : 1842–1954), p. 1. Retrieved 3 October 2012. ^ "Milestones: 1953–1960 - Office of the Historian". history.state.gov. Retrieved 2019-03-14. ^ W. Brands, Jr., Henry (May 1987). "From ANZUS to SEATO: United States Strategic Policy towards Australia and New Zealand, 1952–1954". The International History Review. No. 2. 9: 250–270. doi:10.1080/07075332.1987.9640442. ^ Independent Review Panel (9 July 2004). Report to the Minister Assisting the Minister for Defence (PDF). Retrieved 1 May 2011. ^ Boonkhachorn, Trislipa. "Literary Trends and Literary Promotions in Thailand". Retrieved 24 April 2011. ^ "Sir James Cable". www.telegraph.co.uk. Telegraph Media Group. 13 October 2001. Retrieved 29 March 2011. ^ "Thai given mandate to dissolve SEATO". The Montreal Gazette. 25 September 1975. Retrieved 8 July 2012. ^ "Thailand" (PDF). Army Logistics University. United States Army. Archived from the original (PDF) on 2 May 2014. Retrieved 6 July 2012. Despite the dissolution of the SEATO in 1977, the Manila Pact remains in force and, together with the Thanat-Rusk communiqué of 1962, constitutes the basis of U.S. security commitments to Thailand. Grenville, John; Wasserstein, Bernard, eds. (2001). The Major International Treaties of the Twentieth Century: A History and Guide with Texts. Taylor & Francis. ISBN 978-0-415-14125-3. Dreisbach, Kai (2004). USA und ASEAN. Amerikanische Aussenpolitik und regionale Kooperation in Südostasien vom Vietnamkrieg bis zur Asienkrise (in German). Wissenschaftlicher Verlag. ISBN 3-88476-656-2. This page was last edited on 14 March 2019, at 14:06 (UTC).